There are 21 routes assigned to the "G" zone of the California Route Marker Program, which designates county routes in California. The "G" zone includes county highways in Monterey, San Benito, San Luis Obispo, Santa Clara, and Santa Cruz counties. County Route G1 is a road providing access to Fremont Peak State Park. G1 is signed as San Juan Canyon Road for almost the entire length except for a small portion of The Alameda and Salinas Road. From the southern end of G1 on Fremont Peak as San Juan Canyon Road, G1 begins a steep, sharp-curved winding descent from around 3,000 feet for the first 2 miles, north to northeast. G1 then curves to the west for about 2 miles before turning north. At the intersection of Mission Vineyard Road, G1 becomes The Alameda, which then heads north for approximately 1/4 mile before reaching the northern terminus at State Route 156. Beyond the northern terminus, The Alameda continues into downtown San Juan Bautista for 0.2 miles until the intersection of First Street. County Route G2, more commonly known as Lawrence Expressway and Quito Road, is a busy 9.7-mile (15.6 km) long north–south link through Silicon Valley in Northern California. The majority of G2 is part of the Santa Clara County Expressway System. G2 runs from the Quito Road overcrossing of SR 85 in Saratoga, north along Quito Road. G2 is not signed along this section and is not commonly recognized as existing along this 2 lane road by either locals or mapmakers. The Quito Road portion is also maintained by the City of Saratoga rather than Santa Clara County. As the road leaves Saratoga and enters San Jose, it widens to a 6 lane county-maintained expressway with a concrete island divider; at this point it becomes Lawrence Expressway. The Lawrence Expressway section from just south of Saratoga Avenue is more readily recognized as G2. Local residents almost exclusively refer to G2 as Lawrence Expressway. The road continues north, with access usually restricted to major intersections which are controlled via traffic lights. Lawrence Expressway continues northeasterly and junctions with I-280 and Stevens Creek Boulevard over a complex shared separated grade crossing. Lawrence proceeds under I-280 before immediately rising over Stevens Creek Boulevard. Lawrence Expressway and Stevens Creek Boulevard also share ramps for access to I-280 with the exception of the onramp to Southbound I-280 which is accessed directly from Lawrence Expressway, a frequent cause of confusion for drivers on Stevens Creek Boulevard wishing to access I-280 due to unclear signage. Lawrence Expressway continues north into Santa Clara and widens to 8 lanes with an HOV lane occupying the far right lane. Lawrence Expressway also has another separated grade interchange with El Camino Real (SR 82) with Lawrence Expressway passing over El Camino Real just prior to Lawrence Expressway entering Sunnyvale. At this point the expressway passes over Caltrain's Lawrence Station. Lawrence Expressway also passes under Central Expressway (G6) on a separated grade interchange and over US 101 on a separated grade interchange. The US 101 interchange was upgraded in the early 2000s to include traffic light control on G2. G2 reaches its northern terminus at the end of Lawrence Expressway at the SR 237 Freeway. The physical road continues north as Caribbean Drive. The designation G2 existed to the 1950s. The route replaced what was originally called Lawrence Station Road (after the Southern Pacific Lawrence station), from Mountain View-Alviso Road in the north to Stevens Creek Blvd. on the south, roughly paralleling Saratoga Creek. Lawrence Station was itself named for Alfred Chester Lawrence. Crossing Stevens Creek, the route was originally called Doyle Road, a small two lane road up to the point the current Doyle Road exits to the east. The section between Doyle and Saratoga Avenue at Quito Road was originally orchards. G2 was first signed as a Santa Clara County Route in 1962 as construction was completing on sections of the upgrade to an expressway. County Route G2 was originally planned to link up with SR 85 when it was built. At the time of G2's inception SR 85 was in the early planning stages and an interchange had been envisioned at Quito Road. However opposition to the freeway was intense in Saratoga and the planned interchange between SR 85 and G2 along with an interchange further north at Prospect Road were abandoned in favor of the existing Saratoga Avenue interchange. G2 is unsigned from SR 85 to Saratoga Avenue along Quito Road. North of Saratoga Avenue Lawrence Expressway is currently signed as G2. In the 1990s Lawrence Expressway was widened north of I-280 to 8 lanes to accommodate an HOV carpool lane. The section of Quito Road between Bucknall Road and Saratoga Avenue in Saratoga is slated for expansion to 3 lanes in the fall of 2006. The entire route is in Santa Clara County. Oregon Expressway passing under Alma Street. County Route G3, more commonly known as Page Mill Road and Oregon Expressway is a short 4.5-mile (7.2 km) northeast-southwest arterial route that spans the lower peninsula region of the San Francisco Bay Area from I-280 to US 101. G3 runs through Palo Alto, unincorporated Stanford University lands, and the northwest corner of Los Altos Hills. It is part of the Santa Clara County Expressway System. G3 begins in the west at its interchange with I-280 in Los Altos Hills just south of Stanford University. It proceeds northeast as a four lane expressway over the rolling hills of Stanford University until it reaches Foothill Expressway (G5) with which it shares an at-grade intersection. East of Foothill Expressway, G3 descends down into the more urban areas of the lower peninsula going through the industrialized area of the Stanford Research Park located in Palo Alto. The road along this section has a reduced speed limit and several turnoffs along its length until it reaches El Camino Real (SR 82). After SR 82, Oregon Expressway branches from Page Mill Road, which becomes a short two-lane street, and G3 follows Oregon Expressway under Caltrain tracks and onward for the remainder of its northeastward journey. Oregon Expressway resumes expressway status with limited access confined mainly to large intersections. G3 reaches its eastern terminus at its junction with US 101. Page Mill Road (no longer designated G3) continues southwest of I-280 for 6 miles (9.7 km), a twisting two-lane road that climbs to Skyline Boulevard (SR 35) at the crest of the Santa Cruz Mountains. It passes the entrance to Palo Alto's Foothills Park (which is accessible to Palo Alto residents and their guests only) and the Monte Bello and Los Trancos Open Space Preserves. Under the name West Alpine Road, the road descends west of Skyline Boulevard to a turn-off that leads to Portola Redwoods State Park, where the original Page (saw)mill is located. Other than a commemorative sign, no artifacts remain at the mill site, which is accessible only by Slate Creek Trail from either Portola Redwoods state park or from Skyline Boulevard (SR 35). This route was designated in 1962. G3 is currently signed its entire length. It was originally known as Mayfield-Pescadero Road. County Route G4, more commonly referred to as San Tomas Expressway and Montague Expressway is a busy 14.5-mile (23.34 km) long link across Silicon Valley. G4 is part of the Santa Clara County Expressway System. G4 begins in the south at its interchange with SR 17 and Camden Avenue as San Tomas Expressway in the city of Campbell. The road is three lanes wide in each direction, with an HOV carpool lane occupying the right lane, from SR 17 north to Homestead Road, where it expands to four lanes in each direction with an HOV lane until San Tomas "ends" at US 101. The majority of intersections along San Tomas are at grade, controlled by traffic lights. The only grade-separated intersections along San Tomas are at SR 17, US 101, Winchester (necessary due to a Union Pacific branchline), and the junction with Central Expressway (G6). G4 intersects at grade with El Camino Real in Santa Clara. Further north in Santa Clara, G4 crosses US 101 and becomes Montague Expressway. Montague Expressway is signed as an east–west route, however it is not signed as G4 along its entire length. Montague continues east as an 8 lane road until it crosses Interstate 880 on the San Jose/Milpitas city line, where it loses a lane to become a 6 lane road. G4 reaches its eastern terminus at Interstate 680 but the physical road continues as Landess Ave further east until it ends at its intersection with Piedmont Road. 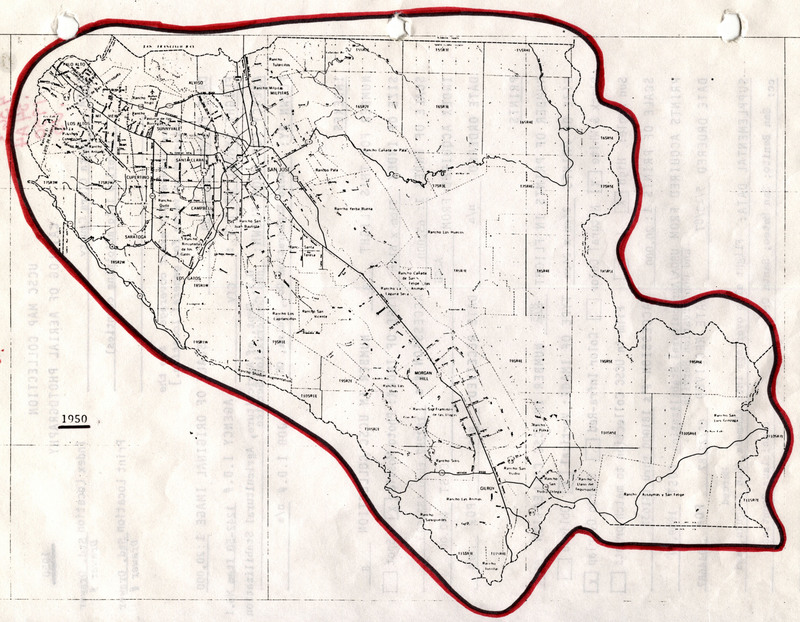 G4 was designated and signed in 1962 along the San Tomas portions. Montague was designated later around 1978. Whether this has anything to do with Montague not being physically signed as G4 is uncertain. Emergency Call boxes along Montague however are labeled as being on G4 leaving no doubt that Montague is part of G4. Original plans called for G4 to originate at present day G21's junction with US 101, then head west via present day Capitol Expressway, Hillsdale Avenue, and Camden Avenue where it would have met the present day southern terminus. These plans were never brought to fruition. County Route G5, more often referred to as Foothill Expressway, is a 4 lane, 7.24-mile (11.65 km) long, northwest-southeast route in Santa Clara County. G5 connects Palo Alto, California to the Silicon Valley proper closely paralleling I-280 through the lower Santa Cruz Mountains foothills. This route is part of the Santa Clara County Expressway System. The speed limit for much of Foothill Expressway is 45 mph. G5 begins at its southeastern end at I-280 in Cupertino, California. It proceeds northwest directly east of I-280 making it a viable alternative route for short trips between Cupertino and Palo Alto. The road is a four-lane expressway along its entire route. Access is generally limited to major intersections that are governed by traffic lights except for an interchange at Fremont Avenue, which the interchange also provides access to Miramonte Avenue and Loyola Drive. G5 travels through several affluent neighborhoods in Los Altos before climbing up into the foothills to its northern terminus at the intersection with Page Mill Road (G3). The physical road continues north as Junipero Serra Boulevard and passes the back entrances to Stanford University. G5 was designated in 1962 and is currently signed its entire length. The route was built upon the right-of-way for the Los Altos branch of the Peninsular Railway. The buildings along the route at Loyola Corners in Los Altos are historical railroad station buildings. In 1970 one of the first scientifically-designed noise barriers in the nation was conceived for Foothill Expressway in a study overseen by the Santa Clara County Public Works Department using Sunnyvale consultant ESL Inc.
County Route G6, which comprises Central Expressway and part of Alma Street in Palo Alto is signed as a 12.3-mile (19.8 km) long, east–west route in the western portion of Silicon Valley, California. While paralleling US 101, El Camino Real (SR 82) and I-280, all of which are signed north–south, Central Expressway is signed east–west. This is due to the fact that all of these routes move in an east–west direction in this area, but these other routes continue longer than Central Expressway and are mostly north–south overall. This route is part of the Santa Clara County Expressway System. Route G6 actually begins in the west at Oregon Expressway as Alma Street in Palo Alto. In Palo Alto, G6 remains a major surface street with four lanes of traffic and a center turning lane to service the many driveways and turnoffs available. At the Palo Alto – Mountain View border at San Antonio Road, G6's character changes, removing the driveways and frequent intersections and adding a center divider, and is renamed Central Expressway. Central continues east as a 4 lane road through the city of Mountain View. Through this section Central Expressway has more at-grade intersections than is typical for a designated expressway. This section's intersections are primarily at-grade with cross streets controlled by traffic lights, although there are some overpasses, such as for San Antonio Road, Shoreline Blvd., Whisman Ave, SR 237 and SR 85. Up to this point, the road parallels the Caltrain rail line, which limits the intersections and driveways on the south side of the road. After crossing under SR 85, Central Expressway takes on a very freeway-like appearance (which is not typical for most county roads) for several miles through Sunnyvale. Through this section Central Expressway has a wide center divider and a sequence of several separated grade interchanges with main cross streets and no turnoffs or driveways. The final in this sequence is at Lawrence Expressway. East of Lawrence Expressway, Central Expressway resumes at grade intersections along with sporadic HOV lanes at the approaches to intersections. Central has one final separated grade interchange with San Tomas Expressway. Central reaches its end at De La Cruz Blvd in Santa Clara, just outside the north end of San Jose International Airport. Route G6 makes a turn on to De La Cruz for a few hundred feet until it reaches US 101, which serves as the route's eastern terminus. Central Expressway was first designated in 1962. Central Expressway was a vital route through the western Silicon Valley in the days before US 101 and I-280 had been widened as an alternate route. Central Expressway still acts as an alternate route to US 101 through the west valley, however usage has declined as both freeways are now much larger and more direct routes. Construction was completed in 2007 near the eastern terminus widening Central Expressway to accommodate an HOV lane and a reconfiguration of the intersection with Lafayette Street. Central Expressway is currently signed as G6 sporadically along its entire length. In 1982, the prohibition against bicyclists using Central Expressway's shoulders was lifted. All pedestrian prohibitions were repealed by 2003. County Route G7 is a road in Santa Clara County southeast of Gilroy. The road is known as Bloomfield Avenue for its entire length, which runs from State Route 25 near US 101 to State Route 152. The route serves as a bypass for travelers who are traveling from westbound State Route 152 to southbound U.S. Route 101. County Route G7 bypasses the State Route 152 at U.S. Route 101 interchange, where State Route 152 is signed as 10th Street. This bypass avoids considerable amounts of traffic congestion that is the result of large retail shopping centers on both sides of 10th Street. County Route G7 also serves Frazier Lake Airpark via Frazier Lake Rd., as well as the Christopher Ranch garlic facility. County Route G8 is an important north–south arterial road from the south valley area of Santa Clara County, California, USA to near Downtown San Jose. G8 runs for 29.4 miles (47.3 km) over both rural roads, expressway and urban streets, but it is most commonly known by residents for its expressway portion, Almaden Expressway. G8 is also part of the Santa Clara County Expressway System. G8 begins in the south at the its junction with State Route 152 in Gilroy. It proceeds north along Watsonville Road as a two-lane country road until it reaches the intersection of Watsonville Rd and Uvas Road. G8 turns left and proceeds north along Uvas Road which is a winding two-lane mountain road that passes by Uvas, Chesbro and Calero reservoirs and their surrounding parks. In Calero Reservoir County Park, Uvas Road is renamed McKean Road and proceeds into the Almaden Valley area of San Jose. At the north end of McKean Rd, G8 turns briefly right on Harry Road for a short distance and then left on to the south end of Almaden Expressway. As Almaden Expressway, G8 begins as a 2-lane undivided road for 1/2 mile before expanding to 4-lane divided expressway approaching the intersection of Almaden Road. Almaden Expressway eventually expands to a 6-8 lane expressway with the majority of access limited to major intersections controlled by traffic signals. The major exception to this is near Highway 85 and Blossom Hill Road (G10) where there are several major shopping centers. G8 intersects G10 at Blossom Hill Rd and SR 85 a quarter mile north. This interchange is one of the busiest in Silicon Valley due to several shopping centers and a Costco warehouse store all sharing driveways with this interchange. G8 continues north resuming its expressway design. G8 shares a separated grade interchange with the terminus of Capitol Expressway Auto Mall and again with Curtner Avenue. Other intersections along this part of the route are at grade. Almaden Expressway crosses State Route 87 with which it shares a northbound only interchange. G8 continues past the north end of Almaden Expressway on to Almaden Road as a 4-lane city street. At the intersection Almaden Road and Alma Avenue, G8 turns east along Alma Ave and proceeds for about a quarter mile to its eastern terminus at First Street (former SR 82). G8 was originally designated in 1962 along Almaden Expwy which had begun construction in 1959. Almaden Expwy was not completed to its southern terminus until 1984. Before that time the section between McKean Rd and the southern end of the expressway (which was further north at the time) took a zig zag path from McKean Rd to Harry Rd to Almaden Road (S) to Barnes Lane, to the then southern end of Almaden Expwy. G8 is signed sporadically along its entire length. County Route G9 is a county road in Gilroy and unincorporated Santa Clara County. The route runs along Leavesley Road from State Route 152's northern interchange with US 101 and then curves southward onto Ferguson Road. The route's southern terminus is at Route 152 (Pacheco Pass Highway) east of Gilroy. County Route G9 serves shoppers traveling to the Gilroy Premium Outlets, which features more than 145 stores and is the largest collection of outlet stores in Northern California. County Route G9 serves several agricultural facilities along its route. It also serves travelers as a bypass around the city of Gilroy, who wish to avoid the congestion at 10th Street and U.S. Route 101. County Route G10, more commonly known along the majority of its route as Blossom Hill Road for the majority of its length is an important east–west arterial roadway through the Almaden Valley area of Santa Clara County, California, in Silicon Valley. The route runs for 10.34 miles (16.64 km) and is a city street for its entire length. G10 begins at its western end at the junction of SR 17 and Los Gatos-Saratoga Road (formerly Saratoga Avenue) in Los Gatos. G10 travels east on Los Gatos-Saratoga Road to the end of that road then turns north east along Los Gatos Boulevard. G10 proceeds for about 3⁄4 mile (1.2 km) to Blossom Hill Road where it turns east. Along this stretch, G10 is a narrow road that proceeds over Blossom Hill, the hill that the road takes its name from. At the base of Blossom Hill, G10 enters San Jose and the Almaden Valley neighborhood. G10 proceeds as a busy 4-6 lane artery through this area, intersecting Almaden Expressway and further east, through the Blossom Valley neighborhood of San Jose, to SR 85. Prior to the completion of the segments of SR 85 between 1991 and 1994, which G10 roughly parallels, Blossom Hill Road was the major accessway to this area of San Jose from the west. G10 reaches its eastern terminus at former prior-to-2013 SR 82, a few hundred feet (~100 m) shy of US 101. Blossom Hill Road continues to US 101 and then over the freeway becoming Silver Creek Valley Road, before continuing as Nieman Boulevard and terminating at the junction with Capitol Expressway. G10 was designated in 1964 as a county road. As of 2005, however, the road is no longer maintained by the county and is city street along its entire length. G10 is also only sporadically signed along its route and has been largely abandoned by the county after the completion of SR 85. County Route G11 is a road in unincorporated Monterey County. The route runs from Watsonville and Pajaro along San Juan Road through the Pajaro Valley and terminates at US 101 south of Aromas. County Route G11 begins as San Juan Road at the intersection of County Route G12 in Pajaro. It leaves Pajaro and continues east for a 3/4 mile before gradually turning southeast towards Aromas. The road enters a brief, but steep hill for a 3/4 mile with a passing lane, then returns as a two-lane road turning south and then southeast. Nearing the eastern terminus at US 101, G11 curves to the east and then sharply turns southeast. G11 crosses into San Benito County approximately one hundred feet (~60 meters) before reaching its terminus at US 101. It provides an alternative route from Gilroy and Hollister towards Santa Cruz, bypassing the twistier, hillier routes 152 and 129, which, like Highway 17, can be daunting to novice drivers. County Route G12 is a road in Santa Cruz and Monterey Counties. The route, running almost 11 miles (18 km), begins at US 101 near Prunedale and follows San Miguel Canyon Road 4 miles (6 km) north-northwestward to Hall Road, onto which the route turns westward for 3 miles (5 km) passing through the community of Las Lomas. This portion arrives at Elkhorn Road, where G12 turns northward for 1 mile (2 km) before joining Salinas Road first to enter Pajaro, where the route becomes Porter Road, and then crosses into Santa Cruz County to enter Watsonville, where the route joins Main Street and terminates at State Route 129. County Route G13 is a county road in Monterey and San Benito Counties. The route runs almost 16 miles (26 km) between King City in Monterey County and Route 25 in San Benito County. G13 begins in King City at the interchange with U.S. Route 101 in King City as a city street. It turns east through downtown King City for one mile before turning northwest on First Street, which then becomes Lyons Street and turning northeast to become Bitterwater Road, passing Mesa Del Rey Airport and leaving the city limits. G13 then enters a hilly area before crossing into San Benito County for an additional six miles and terminating at the junction of State Route 25 at Bitterwater. County Route G14, running approximately 62 miles (100 km), connects the Mission San Antonio area northwest of Jolon, California, in the southern part of the county to Lake Nacimiento and then continues into northern San Luis Obispo County connecting to West 24th Street in Paso Robles where it meets U.S. Route 101 and SR 46 near the California Mid-State Fair fairgrounds. G14 begins at the intersection of US 101 and State Route 46 in Paso Robles. It then heads west for less than one mile (~1.5 km) before leaving the city limits as Nacimiento Lake Drive and turning mainly northwest for 15 miles. G14 then crosses the Nacimiento Dam for 1/4 mile before reaching a steep hill with a brief winding curve. G14 then turns west onto Interlake Road while Nacimiento Lake Drive continues as G19. As Interlake Road, G14 heads west with a brief curve to the north for a few miles and passing Lake San Antonio before turning mainly northwest and eventually north towards the town of Lockwood. Just a few hundred feet (~100 meters) south of Lockwood, G14 reaches the intersection of the western terminus of G18 and heads west along Jolon Road. As G14 reaches the small town of Jolon, a side road provides an entrance to Fort Hunter Liggett military facility while G14 curves to the north. G14 continues north through the southern end of the Santa Lucia range for several miles to reach the southern Salinas Valley. G14 terminates at US 101 west of King City. County Route G14 is a California State Scenic Highway. Monterey County Route G15 is a road running almost 19 miles (31 km) along the eastern edge of the Salinas Valley. The road parallels US 101 (and therefore El Camino Real) between King City and Soledad, with 101 to the west of the Salinas River and G15 to the east and following the western foot of the Gabilan Range. The route begins at US 101 southeast of King City and follows First Street through the city, where it intersects County Route G13 and exits the city as Metz Road. G15 follows this road 17 miles (27 km) northwestward, bypassing Greenfield for the unincorporated community of Metz and terminating at State Route 146 near Soledad. Monterey County Route G16 runs 56 miles (90 km) between the Santa Lucia Range and the Sierra de Salinas in Monterey County, California. The route, beginning from California State Route 1 follows Carmel Valley Road along the Carmel River into the Carmel Valley and southeastward into the community of the same name, near which the road intersects with Monterey County Route G20. After 41 miles (66 km) the route turns eastward onto Arroyo Seco Road near Millers Ranch. At the junction with G17, G16 joins Elm Avenue and enters the Salinas Valley, later passing through Greenfield, crossing the Salinas River, and terminating at Monterey County Route G15 near the valley's eastern edge. County Route G17 was constructed in 1955, and is part of the De Anza National Historic trail. It extends from Reservation Road to Elm Avenue. G17 begins as a three-way intersection with G16 near Millers Ranch as Arroyo Seco Road. It then briefly heads northeast before turning north for several miles closely paralleling the eastern end of the Arroyo Seco until at the intersection at Fort Romie Road south of Fort Romie. G17 then proceeds northwest on Fort Romie Road as Arroyo Seco Road continues east to its terminus at US 101. Just after passing the Mission Soledad historic site, G17 turns southwest for 1000 feet before reverting northwest. G17 continues for another 2 miles until the intersection with Foothill Road, becoming River Road. As River Road, G17 continues northwest for a several more miles along the Salinas River until the intersection with Gonzales River Road near Gonzales, which G17 turns southwest for 1/4 mile before reverting northwest. As the road nears Chualar, G17 has another intersection with Chualar River Road and heads northwest, closely following the Salinas River. Shortly before the interchange with State Route 68, G17 becomes a 4-lane undivided road for about 1/2 mile before reverting to a 2-lane road and becoming Reservation Road. As Reservation Road, G17 continues northwest along the Salinas River with occasional sharp curves until reaching a brief steep hill south of Marina and becoming a 4-lane divided road. G17 remains a 4-lane divided road for most of the length through Marina except between Del Monte Blvd and Beach Road. At Del Monte Blvd, G17 truncates back to a 2-lane city street, progressively turning north, with traffic circles until the intersection of Beach Road. G17 which then turns northwest for 600 feet, resuming a 4-lane road until the northern terminus at State Route 1. This route is signed as Jolon Road and runs between U.S. Route 101 on both ends. Although Jolon Road runs on both ends of 101, the western terminus of G18 is near Lockwood with the intersection of G14 and runs for approximately 16.4 miles. G18 begins at the intersection of G14 (Interlake Road) and proceeds east for several miles as a continuation of Jolon Road. There is a junction with G19 (Nacimiento Lake Road) just a few hundred feet shy of its eastern terminus with highway 101. G19 runs from G18 (Jolon Rd) to G14 (Interlake Rd), and is signed as Nacimiento Lake Road for the whole route. G19's southern terminus is at Interlake Road, which is a continuation of G14 portion of Nacimento Lake Road. G19 heads northeast for approximately 1.25 miles until the intersection with Vista Road. Vista Road provides access to Lake San Antonio, while G19 continues east, progressively turning north and crossing the San Antonio River before a sharp curve to the east. G19 then follows northeast along the San Antonio River for approximately one mile (1.6 km) before continuing north to the end at G18, a few hundred feet from U.S. Route 101 near Bradley. County Route G20, also known as Laureles Grade, is a steep, winding road running 6 miles (10 km) to connect Carmel Valley's G16 with State Route 68 halfway between Monterey and Salinas. Santa Clara County Route G21, more commonly known as Capitol Expressway for the majority of its length is a 9.5-mile (15.3 km) long east–west expressway completely in San Jose, California, USA along the eastern side of the Silicon Valley. Capitol Expressway is part of the Santa Clara County Expressway System. G21 begins as Capitol Expressway Auto Mall in the west at its separated grade junction with Almaden Expressway as a continuation of Hillsdale Avenue. It travels east along Capitol Expressway Auto Mall as an unsigned city maintained street until the road reaches State Route 87. Along this section Capitol Expressway is lined with many car dealerships with multiple driveways and turnoffs in addition to at grade crossings with smaller roads. At the interchange with SR 87 the road becomes Capitol Expressway and takes on a more traditional expressway appearance with limited turnoffs and most entrances being solely at large intersections. Capitol Expressway continues south east to a junction with Highway 101 and then into East San Jose. In East San Jose Capitol Expressway intersects with I-680 and officially ends at Jackson Avenue, changing names into E. San Antonio Street. A common misconception is that Capitol Expressway makes an abrupt turn to the northeast toward Alum Rock. This road is actually called Capitol Avenue and continues on towards Milpitas and serves as a major corridor through the North Valley. Capitol Avenue reaches its northern terminus in Milpitas at the intersection of Montague Expressway. Capitol Expressway was designated in 1978 from Almaden Expressway to US 101. Construction on the eastern portion from US 101 to I-680 was not completed until 1997. In the late 1990s the portion of the Expressway from Almaden Expressway to SR 87 was transferred from Santa Clara County to the city of San Jose. The road was then renamed Capitol Expressway Auto Mall. Capitol Expressway is currently unsigned from Almaden Expressway to SR 87 however it is signed east of SR 87. ^ a b c d e f g h i j k l m n o p q r s t u v w x Faigin, Daniel. "County Routes 'G'". California Highways. Archived from the original on 2010-01-15. Retrieved 2010-01-29. ^ "Santa Clara Street Names Reflect its History". Retrieved 2019-03-24. ^ Florence M. Fava (1976). Los Altos Hills, The colorful story. Woodside, CA: Gilbert Richards Publications. ^ "California Highways (www.cahighways.org): County Routes "G"". www.cahighways.org. Archived from the original on 3 July 2017. Retrieved 26 April 2018. This page was last edited on 24 April 2019, at 15:56 (UTC).